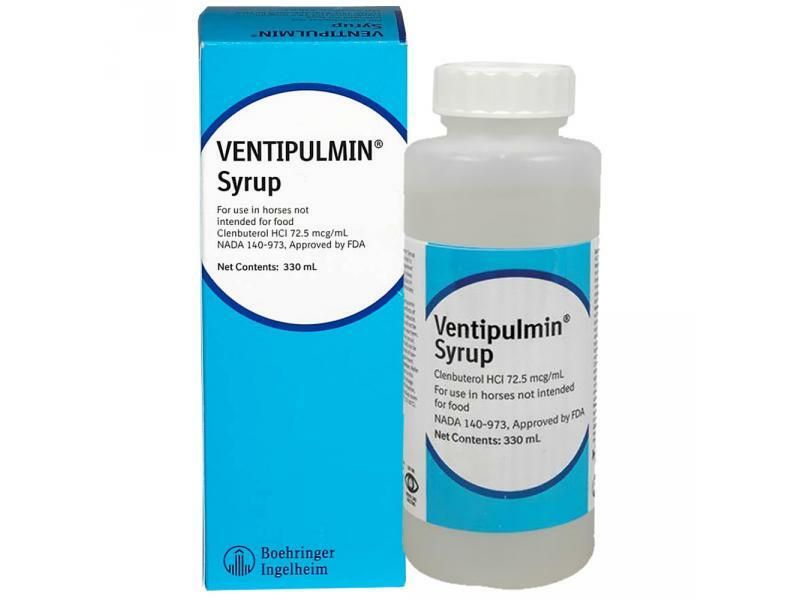 Ventipulmin is a drug used to open the respiratory passages of horses and to help clear them of mucus. This can be beneficial in some allergic respiratory diseases, often associated with a cough, due to mould spores in hay and straw (chronic obstructive pulmonary disease or COPD). 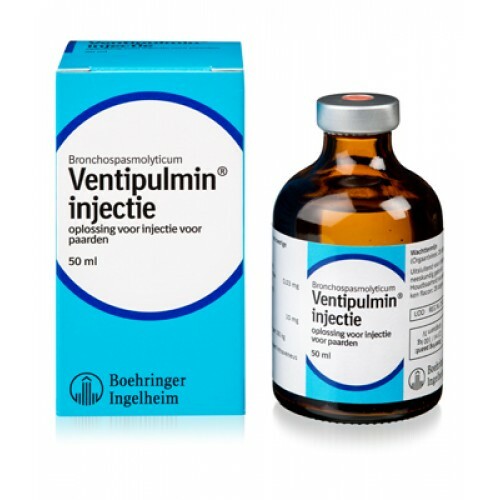 Ventipulmin is also useful in cases where infection of the respiratory tract is involved, such as equine influenza. Where bacterial infection is present, antibiotics can be used as well. 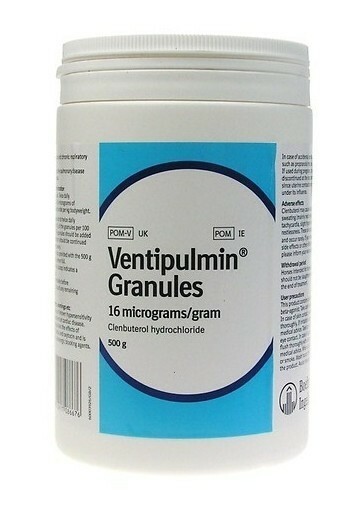 Ventipulmin is available as Ventipulmin Granules or Ventipulmin Syrup to add to food. 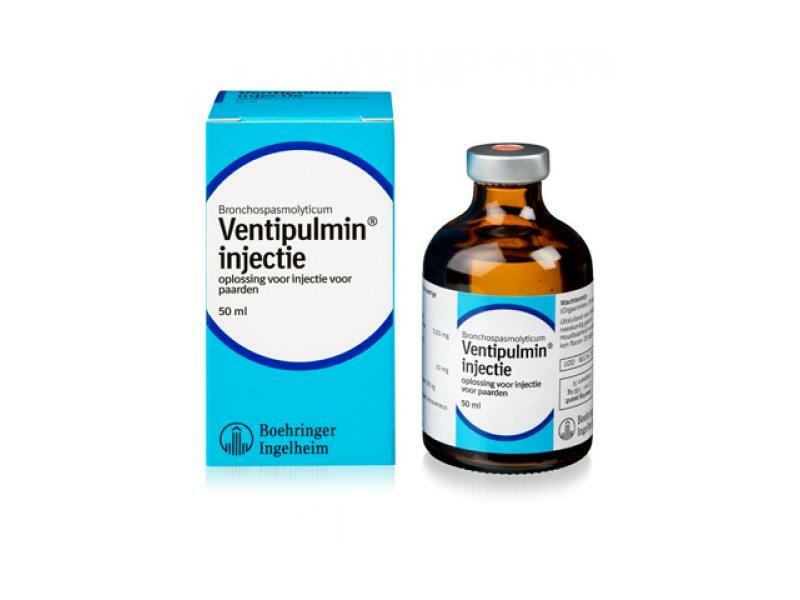 There is also a Ventipulmin Injection available. White, finely grained free flowing granules. Each gram of granules contains 16 micrograms of clenbuterol hydrochloride. Twice daily administration of 0.8 micrograms clenbuterol per kg bodyweight, for as long as necessary. This is equivalent to twice daily administration of 5g granules per 100kg bodyweight. The granules should be added to the feed. Add to feed immediately before administration. Discard any remaining medicated feed. A measuring scoop is provided with the 500g pack. When full, the scoop contains 10g. A second line on the scoop indicates a half measure (5g). Do not use in horses with known cardiac disease. Do not use in animals with known hypersensitivity to the active substance. This product contains clenbuterol, a beta-agonist. Take care to avoid skin contact. In case of skin contact wash affected area thoroughly. If irritation occurs/persists seek medical advice. Take care to avoid accidental eye contact. In the case of accidental eye contact, flush thoroughly with clean water and seek medical advice. When using do not eat, drink or smoke. Wash hands thoroughly after using the product. Avoid inhaling dust. Clenbuterol may cause side effects such as sweating (mainly neck region), muscle tremor, tachycardia, slight hypotension or restlessness. These are typical for β-agonists and occur rarely. Ventipulmin antagonises the effects of prostaglandin F2α and oxytocin. Ventipulmin is antagonised by β-adrenergic blocking agents. If used during pregnancy, treatment must be discontinued at the expected time of delivery since uterine contractions may be abolished under its influence. Dosages of clenbuterol hydrochloride up to 4 times the therapeutic dose (administered orally) for a period of 90 days caused transient side effects typical for beta2-adrenoceptor agonists (sweating, tachycardia, muscle tremor), which required no treatment. In case of accidental overdose, a β-blocker (such as propranolol) may be used as antidote. Shelf life of the medicinal product as packaged for sale : 3 years. Do not store above 30°C. Protect from light. Discard unused material. Add to feed immediately before administration. Discard remaining medicated feed. The product is packed in a polyethylene container with a push-fit polyethylene cap. The container is filled with 500 g granules. A polystyrene measuring spoon, graduated at 5g and 10g is also supplied. The product contains the active ingredient clenbuterol hydrochloride which is a sympathomimetic amine with a high degree of selectivity for the B2-receptor sites in the body, thus providing intense bronchodilating properties with minimum effect on the cardiovascular system. It has been shown to stimulate mucociliary clearance in horses. The effects on pulmonary function and clinical response have been assessed in clinical trials with horses suffering from a variety of respiratory conditions. A marked decrease in intrathoracic pressure, a decrease in respiratory rate, an initial decrease followed by an increase in arterial oxygen partial pressure and clinical improvements were observed. In addition, a significant reduction in resistance to airflow and a clinical improvement in the animals respiratory pattern were seen. The active substance is well absorbed following oral administration. Oral and parenteral dose rates are identical at 0.08 micrograms per kg bodyweight. Clear colourless syrup. Each ml contains 25 micrograms clenbuterol hydrochloride as active substance plus 1.8 mg methyl parahydroxybenzoate and 0.2 mg propyl parahydroxybenzoate as excipients. Treatment of respiratory disease in horses where it is considered that airway obstruction due to bronchospasm and/or accumulation of mucus is a contributing factor, and improved mucociliary clearance is desirable. To be used alone or as adjuvant therapy.. In cases complicated by bacterial infection, the administration of antimicrobial agents is recommended. For oral use. Administer 4 ml Ventipulmin Syrup per 125 kg bodyweight twice daily. This is equivalent to twice daily administration of 0.8 micrograms clenbuterol hydrochloride per kg bodyweight. The syrup should be added to the feed. (One depression of the pump delivers 4 ml syrup). Treatment should continue for as long as necessary. Do not use in cases of known hypersensitivity to the active ingredient. Do not use in horses with known cardiac disease. Take care to avoid skin contact. In case of skin contact wash affected area thoroughly. If irritation occurs/persists seek medical advice. Take care to avoid accidental eye contact. In the case of accidental eye contact, flush thoroughly with clean water and seek medical advice. When using do not eat, drink or smoke. Wash hands thoroughly after using the product. Ventipulmin antagonises the effects of prostaglandin F2α and oxytocin. Ventipulmin is antagonised by β-adrenergic blocking agents. Shelf life of the medicinal product as packaged for sale : 2 years. Shelf life after first opening the immediate packaging : 30 days. To be supplied only on veterinary prescription. Keep the bottle in outer carton. 355ml screw top polyethylene bottle with a 4ml pump dispenser. ATC Vet code : QR03CC13: Drugs for obstructive airway disease. Ventipulmin contains clenbuterol hydrochloride, which is a sympathomimetic amine which preferentially binds to β2 adrenoreceptors on cell membranes of the bronchi. This subsequently activates the enzyme adenylate cyclase in smooth muscle cells, thus providing intense bronchodilating properties and decreasing airway resistance with minimum effect on the cardiovascular system. 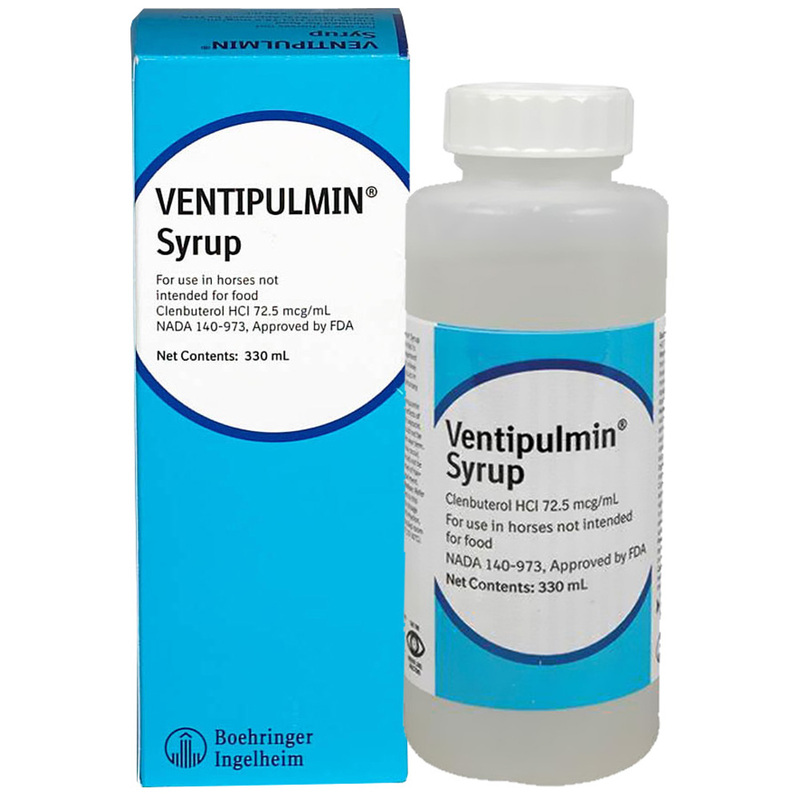 Ventipulmin has been shown to inhibit histamine release from mast cells in the lungs, and enhance mucociliary clearance in horses. After oral administration in horses, clenbuterol is readily absorbed and maximum plasma concentrations reached within 2 hours of dosing. Steady state level in plasma is reached after 3-5 days treatment and range from 1.0 – 2.2 ng/ml. The substance is rapidly distributed in tissues and metabolised primarily by the liver. Clenbuterol is the main excretory product and approximately 45% of the dose is eliminated unchanged in the urine. The kidneys excrete 70 – 91% of the total dose, and the remainder is eliminated in the faeces (6 – 15%). Clear colourless solution for injection. Each ml contains 30 micrograms clenbuterol hydrochloride as active substance and 10 mg benzyl alcohol as preservative. Treatment of respiratory disease in horses where it is considered that airway obstruction due to bronchospasm and/or accumulation of mucus is a contributing factor, and improved muco-ciliary clearance is desirable. To be used alone or as adjuvant therapy. Administer by slow intravenous injection at a dose of 2.7ml per 100kg bodyweight twice daily for as long as necessary. This is equivalent to twice daily administration of 0.8 micrograms clenbuterol hydrochloride per kg bodyweight. This product contains clenbuterol, a β-agonist. Take care to avoid skin contact. In case of skin contact wash affected area thoroughly. If irritation occurs/persists seek medical advice. Take care to avoid accidental eye contact. In the case of accidental eye contact, flush thoroughly with clean water and seek medical advice. When using do not eat, drink or smoke. Wash hands thoroughly after using the product. Accidental self-injection may produce tachycardia and tremor. These effects may be reversed by the use of a non-selective beta-blocker. If accidental self-injection occurs seek medical advice immediately, avoiding driving if possible. In clinical use, it has been noted that following intravenous administration to horses, cases of transient mild muscle tremor and sweating were observed. It is suggested that a ‘bolus’ effect may have occurred in these cases and caused transient peripheral vasodilation. This vasodilation is a feature exhibited by all beta-adrenergic drugs to a greater or lesser degree. These effects may be minimised by administering the product slowly. This product antagonises the effects of prostaglandin F2-alpha and oxytocin. This product is antagonised by beta-adrenergic blocking agents. In case of accidental overdose, a β-blocker such as propanolol may be used. Shelf life after first opening the immediate packaging : 28 days. Do not store above 25°C. Protect from light. Following withdrawal of the first dose use the product within 28 days. Discard unused material. Avoid the introduction of contamination during use. Should any growth or discolouration occur the product should be discarded. 50ml amber glass injection vial (Ph Eur. Type II), with pink bromobutyl rubber stopper and aluminium crimp cap. The product contains the active ingredient clenbuterol hydrochloride, which is a sympathomimetic amine with a high degree of selectivity for the B2-receptor sites in the body, thus providing intense bronchodilating properties with minimum effect on the cardiovascular system. It has been shown to stimulate muco-ciliary clearance in horses. A marked decrease in intrathoracic pressure, a decrease in respiratory rate, an initial decrease followed by an increase in arterial oxygen partial pressure and clinical improvements were observed. In addition, a significant reduction in resistance to airflow and a clinical improvement in the animals respiratory pattern were seen. There are currently no questions for Ventipulmin for Horses - be the first to ask one!